JUMPGA PROGRAMMES with amazing cross-training benefits that meet every scientific criteria for the perfect training regime. They will increase stamina, flexibility, agility, focus—the list is endless. So if you’re looking to cross train and enhance your physicality and mental strength make one or all of them your practice of choice. 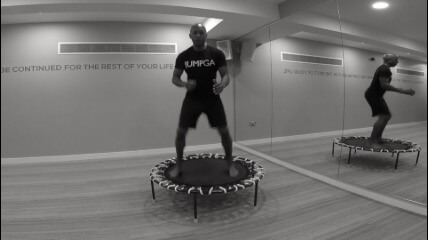 JUMPGA EXPRESS a totally new approach to a fitness class format. ‘JumpGa Express’ is an industry first: a drop-in, drop-out session for the busy time-pushed exercisers. The 4-10-minute total fitness workouts (that can be done at home) is repeated (just like doing sets in weight training) – you choose how many sets you have time for, or how fit you are! Sometimes even Yogis want to blow off steam quickly. If you have enough room to hold a rebounder, you have space to train effectively at home. CARDIO IS GOOD for overall fitness, but there is not much cardio to be found in traditional yoga classes. This workout challenges your cardio-vascular endurance and allows you to manifest your full range of power, adding vitality beyond just the stretch. It gives you the best of both worlds, while still keeping the YOGA mind and body benefits that you love. THIS IS FOR the Yogi who struggles with meditation or breath work. To breathe fully is to live fully; to create a pathway to a deep centeredness. Focused breathing during jumping develops more immediate and precise control of the physical body and will help make almost all yoga poses feel more manageable. ‘JumpGa’ IS A peaceful, yet challenging practice that won’t teach you how to box. This particular programme was specially developed for Darren Barker who went on to become the World Middleweight boxing champion. He needed to manifest his inborn potential to defend and attack with explosive power from any position at any moment. FOUR PROGRAMMES with amazing cross-training benefits that meet every scientific criteria for the perfect training regime. They will increase stamina, flexibility, agility, focus—the list is endless. So if you’re looking to cross train and enhance your physicality and mental strength make one or all of them your practice of choice.